What Does Diversity and Inclusion Mean? – Luzilda Carrillo, Ph.D.
First published February 7 2019 in Anthropology News. In December 2018, I called the founder of a diversity management organization to ask about a meeting where he pitched a university diversity research center to a white male faculty member. While the meeting generally went well, he said that “there was a black woman there, [and] she wasn’t buying any of it.” When I asked why, he said, “She just didn’t want to make any money. She kept pushing social justice, social justice, social justice.” He told her, that would not work. We’d had numerous conversations in his organization about how the best approach to implementing diversity took on a “business case,” or an economic rationale for doing diversity. He and other diversity professionals believe that tying diversity to profit ensures that programs are not cut from the budget and that this strategy incentivizes employees and executives to do year-to-year diversity work. Recognized as part and parcel of the neoliberalization of the academy, faculty members—especially left-leaning ones—resist these diversity logics. 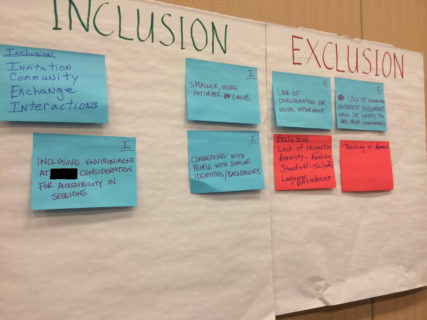 In the spirit of creating alternatives to capitalism that also recognize the importance of advocating for institutionally marginalized students, I suggest that we ask: What does diversity and inclusion mean to our departments and to our schools?What does diversity and inclusion mean to our departments and to our schools? As useful as the business/social justice binary is, before assuming that our actions fall in line with the latter we need to define it empirically. In doing so, we cannot forget the contributions that women of color have done to extend our understanding of institutional inequalities and historical oppression. Beyond anthropologists, this includes the notable works of Kimberle Crenshaw, Chandra Mohanty, Ida B. Wells, Gloria Anzaldúa, Angela Davis, and more recently, Linda Tuhiwai Smith, Michelle Alexander, Sylvia Winters, and Lisa Lowe—just to name a very few (please add more in the comments). To move beyond critique, I ask us to heed the advice that Robin D.G. Kelley gave at the San José American Anthropological Association Annual Meeting. Paraphrasing Dr. Martin Martin Luther King Jr., Kelley said that we cannot wait to create social change; we need to bend the moral arc towards justice. This needs to be a community—rather than pseudo-corporate— effort, driven by the hope that we will see its rewards in the future.Diversity and inclusion is a neoliberal artifact, but this does not mean that it cannot be a tool for revolutionary change.